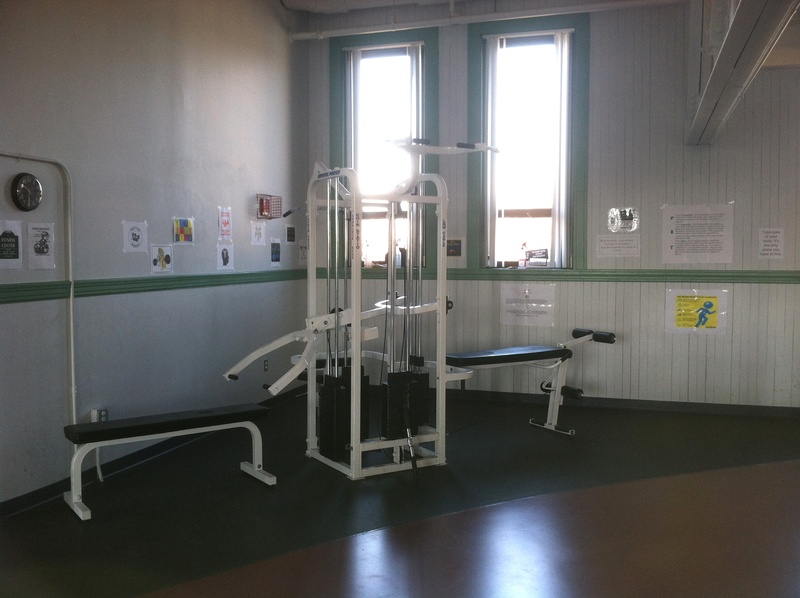 There’s a neighborhood community center four blocks from my house in Boston, and a few times a week I go there to use the exercise machines. There’s only one of each type of machine and there are no TVs or other gym amenities, but that’s fine with me—the community center has what I need, and I like the range of people I run into there, from the four-year-old daycare class looking for a warm indoor spot to run around, to the weekly seniors basketball game. 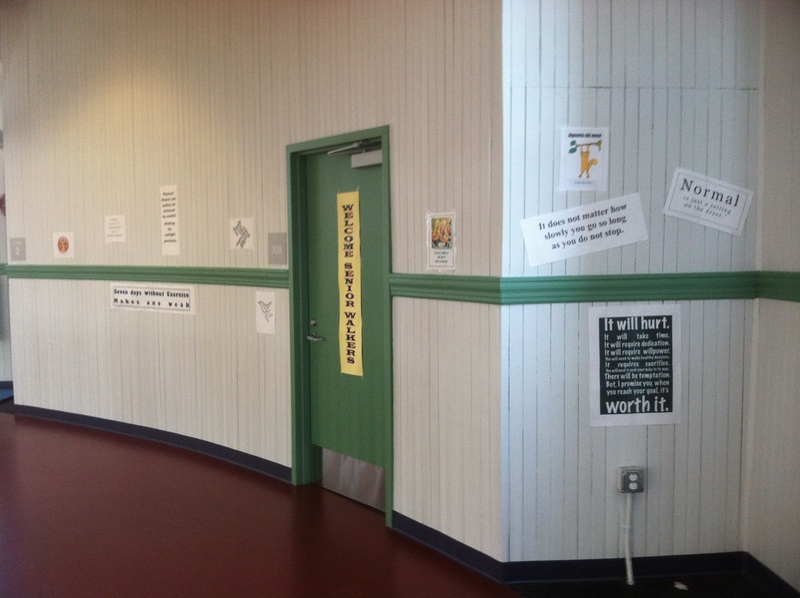 When I first started making regular trips to the community center I found the signs well-intentioned but overwhelming. Although the messages create a “we’re all in this together” atmosphere, the arrangement and sheer volume meant my eyes would cast about continuously with nowhere to land. Now that I have settled into the place I just look at my kindle and screen them out. 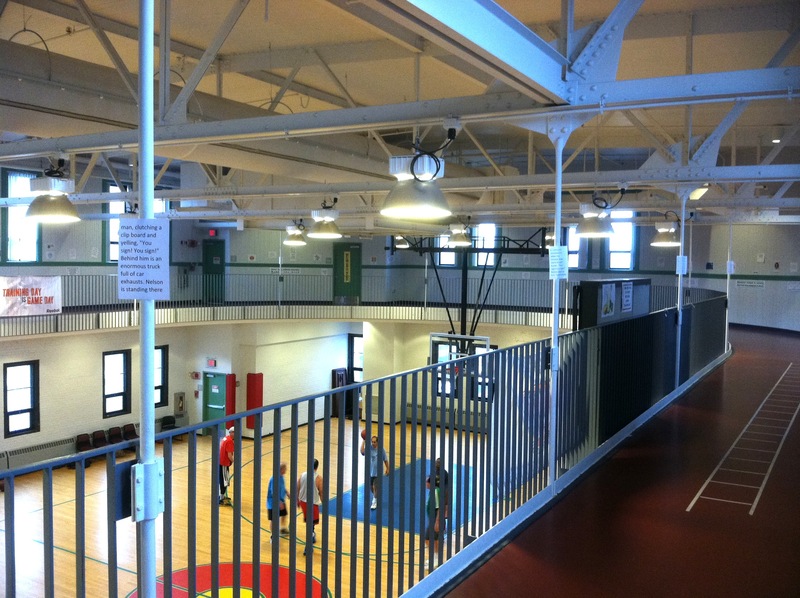 My experience at the community center has me thinking about museum pop-up projects. Pop-up projects are a relatively new thing for museums; in fact it’s one of the seven trends featured in the Center for the Future of Museums’ recently released TrendsWatch 2012. Sometimes an exhibition “pops up” at a temporary location inside an empty storefront or otherwise available space. The San Francisco Museum of Craft and Design has been getting some press recently for creating such exhibitions. But pop-up projects don’t have to be indoors, and they don’t have to look like traditional exhibitions either. For the Westminster Stories project, the Museum on Site put interpretive labels on street furniture, urban trees, sidewalks, buildings, and even people as a weekend-long pop-up event along a two-block stretch of Westminster Street in downtown Providence. The If This House Could Talk project enlists the help of local residents to pop up temporary historical markers in the front yards of homes and businesses in Cambridge, MA, for a few weeks each October. In Hamburg, Germany, the Fussnote Project spraypainted historical markers related to the city’s Nazi-era history on sidewalks. I’m particularly interested in the outdoor version of pop-ups as a tool for city museums. Outdoor pop-up projects were made for cities, where the population density means they are sure to draw a crowd. And what better subject matter for pop-ups than urban history, because out on the streets and in neighborhoods it can help people form deeper personal connections to the places where they live and work. Moreover, bringing urban history to people in outdoor public spaces with such a flexible, changing format gives city museums the opportunity to actively and creatively contribute to the vibrancy of city life instead of merely documenting it after the fact. Other tableaus have included a robot marriage proposal, a robot travel agency, and a robot birthday party. When I lived in Ann Arbor and walked several times a week between my co-working space on Main Street and the bus depot on 4th Avenue, I planned my route to pass Robot Supply & Repair and check if there was a new window display. For regulars, who know a neighborhood well, a change like this can be the difference between a boring commute (or trip to the grocery store, or exercise session) where we are disengaged with the world around us, and an interesting one where space becomes place. 2. Pop-ups work because they are somewhere unexpected, or they involve an unexpected format. In a space overflowing with messaging, the poles lining the community center track were new territory. I had screened out all the motivational signs taped to the walls, much the way we screen out the advertising in places like Times Square or in the borders of our Google searches. 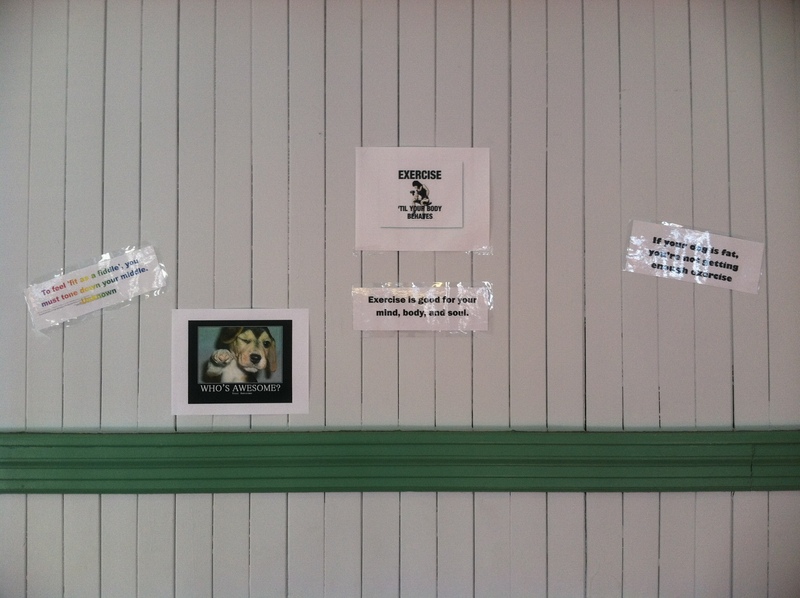 But the jokes caught my eye because I wasn’t used to seeing content on the poles. Similarly, I think part of the reason Cambridge’s If This House Could Talk and Hamburg’s Fussnote Project drew attention is because the format—hand-written signs in front yards or stenciled and spraypainted text—was unexpected. At first I thought someone had come along with a leaky can of paint, but it became clear that this was no accidental line. It stretched on Centre/South Street all the way from Green Street to St. Mark in one smooth, continuous line. I saw two different families with young kids who were just as captivated by the mysterious line as I was: what did it mean? Why was it there? Should we follow it? I’ve never been able to find out who made the line and what his/her intent was, but I’ve thought a lot about its potential as a delivery format. 3. Pop-ups work because they are in people’s everyday path. I don’t have to go out of my way to read the jokes, or see the Robot Supply window, or find the blue line; they appear right in front of me in the course of my normal routine. Don’t get me wrong—visits to the museum are important too, especially if the experience is visitor-centered and memorable. Such visits are generally planned, which can make them feel like anticipated, special events. But if the point is to enrich the lives of as many people as possible, why not also bring the content directly to those people, in high-trafficked outdoor spaces? A serendipitous encounter inserted into the everyday can be just as memorable—and meaningful—as the special event. 4. Some of the best pop-up projects are cheap and low-tech. All of the work I have referenced in this post has been inexpensive and relatively quick and easy to execute. When the content is intentionally so temporary, it can be made on the office laser printer. By contrast, exhibitions inside the museum can cost hundreds of thousands of dollars and months or years of planning; consequently in many institutions the content doesn’t change very often. Museums need to be doing a lot more experimenting if they are ever going to figure out how to increase their public value. Pop-up projects enable experimentation by minimizing cost—who cares that it wasn’t 100% perfect the first time if it only costs $100 and can be improved when you try it again in a different neighborhood? 5. Pop-ups work when they happen on people’s own terms. Yesterday I watched a fellow community center exerciser take a close-up photo of one of the motivational signs. Clearly it meant something to her and she wanted to remember it. There’s room for her to take the signs to heart and for me to screen out all but the jokes, and probably even for any of us to actively participate by suggesting new signs to hang up, because no one is standing there telling us there’s a specific way to behave. Another thing that pops up in outdoor public spaces is the charity solicitor—Save the Children or Greenpeace or Oxfam. Regardless of whether or not I support these organizations, I find it intrusive to be stopped on the street and put on the spot about donating. I like it when pop-up projects leave room for people to make their own choices about whether and how much to engage with the content. 6. A little narrative never hurts. Those long-form jokes are stories, meted out a little at a time around the track. So are the robot tableaus. 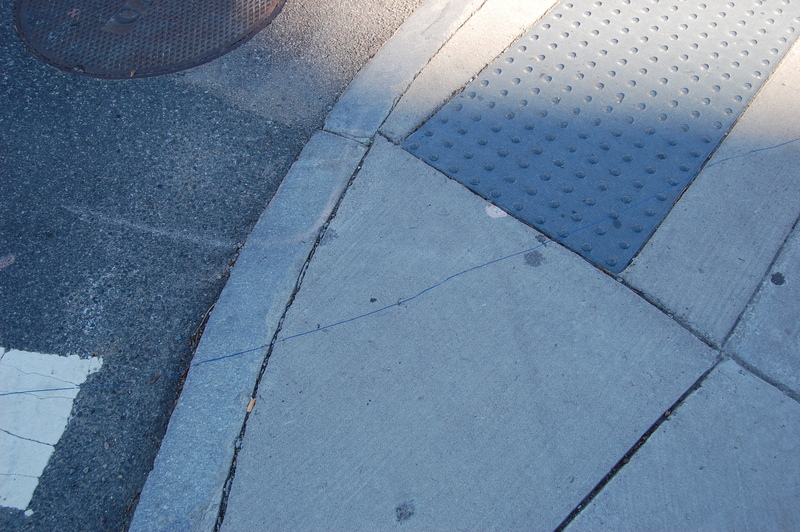 Meanwhile, the blue line on the sidewalk challenged people to imagine their own story. These narratives keep us engaged because we want to know what happens at the end. The Center for the Future of Museums’ TrendsWatch 2012 suggests that pop-ups may be “a reaction against a world becoming too global and too plugged-in. Face-to-face and participatory experiences, especially in unexpected places, can serve as a counterweight to digital, virtual experiences” (p. 12). Whether this is true or not, I think they are here to stay for the foreseeable future. I’d love to hear about any pop-up projects you’ve encountered (or created) in your own city. What worked and didn’t work for you?